I don't think it is fair that GM won't give Buick a convertible. Pontiac will have 2. Cadillac has 1. Saturn is getting 1. Saab has 1. I fell in love with the Bengal concept about 6 years ago and waited to be able to buy one. Then the Velite. Buick needs a convertible, soon. I'd like to see a Lucerne convertible. 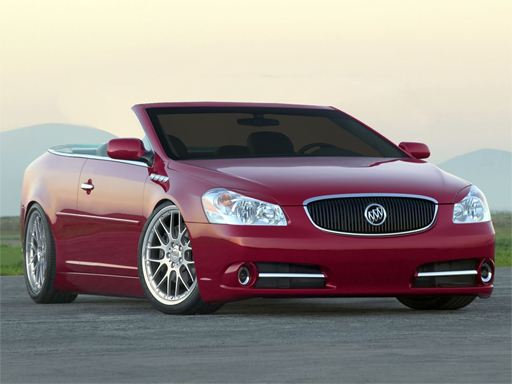 I also think Buick should get a version of the G-6 convertible. If GM can rebadge the Solstice, and rebadge several minivans, why not the g-6? Possibly, but is the G6 worthy as a starting point? Someone suggested rebadging a Saab convertible as a Buick, and thegriffon stated they may do just that. If I remember right there was some talk of making the Velite off the G6 after Zeta was screwed up. I would buy a 4 seat Buick convertible in a second. After a Saab (piece of crap) convertible, Mercedes convertible (crash) and BMW convertibles, I want to buy American, and Buick is the American car in that league. Chrysler Sebring is too rental, and Caddy's is too small and too expensive. Anybody know how hard it would be for GM to make a Lucerne convertible? COuld it be done in the same factory? It's time for a Buick ragtop! You dug this topic out of the grave to say that?? I'd like to see a Lucerne convertible. I also think Buick should get a version of the G-6 convertible. If GM can rebadge the Solstice, and rebadge several minivans, why not the g-6? I like that a lot. The new Riviera!! A Lucerne Convertible would be a great add to the line. I saw a picture ( i think it was doctored a bit) of the lucerne as a convertible. The headlights have a narrower and kind of a "mean look" to them. Heres a picture of a "tuned out" one.